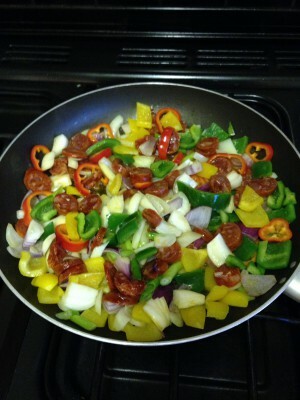 Chop the peppers, onions and spring onions in to smallish pieces and add to a large frying pan with the olive oil. Chop the chorizo in to small slices or chunks and add to the peppers etc. Heat on high to medium heat until the juices and colouring of the chorizo show through in olive oil. After adding the rice, poor in the chicken stock, bring to the boil, then turn down to simmer. Cook until the stock is absorbed by the rice. Once the stock has been absorbed add a little more water, then add the prawn and peas on top of the pan ingredients. Cook for a further 10 minutes on a low heat, then serve. 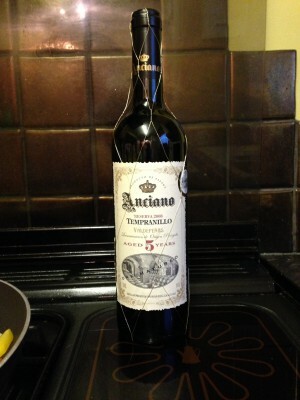 Meal goes down very well with a nice glass of Spanish red wine.